The online community weighed in heavily on the tax cut deal struck between President Obama and congressional Republicans. In this case, the greatest split came among the liberal commentators themselves who were divided in their assessments of the deal. 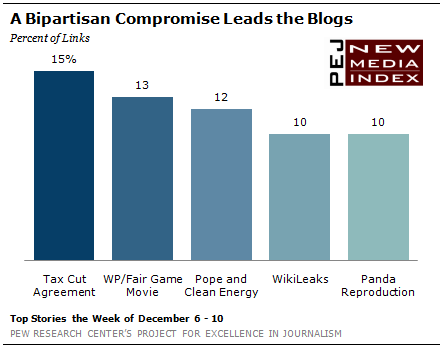 For the week of December 6-10, 15% of the news links on blogs were about the tax cut accord, making it the No. 1 subject, according to the New Media Index from the Pew Research Center’s Project for Excellence in Journalism. Public survey data from the Pew Research Center showed strong support across party lines for the agreed upon tax cuts. Within the active blogger community, though, greater nuance arose, revealing a tension among liberals as to whether to support the benefits the cuts will bring or criticize the President for the compromise. The majority of liberal bloggers criticized the President for accepting the deal which included an extension of the tax cuts for the richest 2% of the public. Some on the left, though, agreed with Obama that the deal was the best option he could get under the political circumstances. On the conservative side, bloggers were mostly satisfied with the compromise, though they directed little praise at Obama for his role in it. The other major story that drew attention last week was the continuing controversy over the leak of classified State Department cables by the website WikiLeaks. The subject was No. 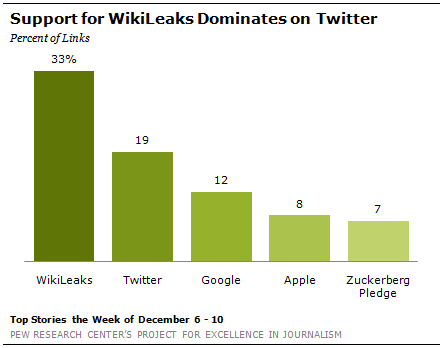 1 on Twitter with 33% of the news links and tied for fourth on blogs (at 10%). In this debate, the social media community mostly countered broader public opinion. While 60% of those paying attention to the story said WikiLeaks harmed the public interest, the vast majority of bloggers and Twitterers defended the leaked material as a positive example of free speech. Supporters on Twitter, for example, agreed with an editorial by Wired editor Evan Hansen who expressed his view that WikiLeaks is good for America because the exposure of information strengthens democracy. They also highlighted a number of news stories that demonstrated a suspicion that powerful entities, such as the State Department and large corporations, were working to censor the flow of information. Liberal bloggers were divided over whether to support Obama’s tax cut compromise with the GOP. Most saw the tax cuts as a huge disappointment and that Obama was failing as a leader. "This is a huge defeat for this administration and, as one of the Democratic base I am extremely disappointed. As one moderate Democrat told me today, ‘For the first time I regret my vote for Obama. Not against McCain, but against Hillary,’" posted AstrosGirlKel at The Daily Hurricane. "Obama and his staff of Merry Dems: the (sales) gang that couldn’t shoot straight," wrote Michael Anderson in a comment on Jeff Pelline’s Sierra Foothills Report. "I understand that Obama has accomplished a huge amount during his first 2 years. But his marketing approach and communication skills are horrible. ‘Hello Kitty’ has a better bully pulpit." Some, however, gave the President credit for reaching a deal. "I have to tell you, I’m not all that unhappy with the results. This is an actual compromise deal," admitted Susie Madrak at Suburban Guerilla. "First of all, the unemployed who are still collecting benefits get to heave a sigh of relief, because they’re covered for the next 13 months…But that’s not all. The package includes a shiny new one-year 2% payroll-tax cut for employees, which will stimulate the economy because the people who get it are the ones most likely to spend it." Conservatives generally agreed that the deal was the best move for the country. And some basked in what they saw as a victory over liberal ideology. "Ultimately, once the liberal base gets over its snit, this deal has the potential of being a good one for the President that may actually get this economy turned around," asserted Merv at Prairie Pundit. "After two years of life under the political heel of smug progressives, it feels good to know how much it is killing all of the leftists who thought Hope and Change meant a fundamental redistribution of wealth in the United States," added Psota at Free Will. There were some-outside clear party lines-who expressed pessimism about the entire political process. "What we’ve really witnessed is that each party is so concerned with implementing a small number of its policy initiatives so it can claim political victory," explained MSG at DOPP Lure Effect. "The end result of this intense politicking is that we, the voters, have the same tax levels, higher unemployment, and more debt piled on. Pardon me if I’m not giddy. Why is it that each time a party gets a win, the American people lose?" For the second week in a row, the WikiLeaks issue was a major focus of social media. The first week, most of the conversation focused on Obama’s response to the leaks, where commentators criticized him for not protecting security information. This week, bloggers and Twitterers turned to the question of whether the leaks were a positive example of free speech or a detrimental breach of national security. And in social media, the concept of transparency had far more supporters than detractors. Most bloggers linked to-and opposed-a December 7 Washington Post column by Marc Thiessen, which advocated for an attack on WikiLeaks by the U.S. government. On Twitter, supporters of WikiLeaks shared a Wired editorial that declared the site to be good for America. "Wired spells out why Wikileaks is good for America," tweeted Shaminder Dulai. "I couldn’t agree more!" "A free press-unfettered by concerns of nationalism-is a terrifying problem for elected governments and tyrannies alike," declared Kris Kotarski. Twitter users also drew attention to corporate or government entities they thought were working to slow the spread of information from WikiLeaks. Many, for example, pointed to a CNET story about a move by MasterCard to stop allowing payments to WikiLeaks in an effort to stop funding for the controversial site. "Freedom of Speech – priceless. For everything else, there’s MasterCard," wrote Marc Silver. Others took note of a Mashable story about a State Department official who warned students at Columbia University that discussing the subject of WikiLeaks on Facebook or Twitter could hurt their long-term job prospects. Some questioned why the heavily discussed issue was not listed as a "trending topic" on Twitter. "#Twitter, stop keeping #Wikileaks off the trending topics, because everyone knows it’s hot right now so you really shouldn’t suppress it," accused Robin Kanters. Opponents of WikiLeaks were rare online, although a BBC report stating that a list of important U.S. security facilities had been leaked as part of the cables gave a few people pause. "First evidence I’ve seen of them being irresponsible," admitted Goldmare. Beyond the WikiLeaks controversy, the other lead stories on Twitter last week were also technology-focused. All the stories were from the popular tech site Mashable and several of them involved a look back at 2010. The No. 2 subject, with 19% of the week’s links, was Twitter itself as users linked to several different stories related to the social networking platform. One was a warning about a popular link "goo.gl/R7f68" that appeared tied to various malware-laden sites. Another was a Mashable report on a study released by the Pew Internet & American Life Project about the types of people who use Twitter and their reasons for doing so. Google was No. 3 (at 12%) with two different articles. The first was a story about Google’s yearly Zeitgeist report which revealed the most popular search terms of 2010. The second was an article about Google’s new advertising platform for local businesses that is being tested in Portland, Oregon. Stories about Apple were fourth at 8% including a list of the top iPhone and iPad apps of the year according to Mashable. That was followed (at 7%) by news that Facebook founder Mark Zuckerberg has signed onto the "giving pledge" created by Bill Gates and Warren Buffett to donate most of his wealth to charity. In the blogosphere, the other lead subjects beyond the tax cut deal were a combination of politics and the environment. The second most linked-to story (at 13%) was a critical editorial by the Washington Post about the recently released movie "Fair Game" based on the Valerie Plame/CIA leak affair. Third, at 12%, was news that Pope Benedict XVI announced he would gladly use a solar-powered popemobile as a sign of support for sustainable energy. Two very different stories tied for fourth at 10%, the WikiLeaks issue and a BBC article about conservationists in China who announced a breakthrough in successful mating of giant pandas which could allow them to be reintroduced into the wild. A television stunt gone wrong was the leading subject on YouTube last week. The two most viewed news videos last week both involved an accident that occurred on a live broadcast of a popular German game show called "Wetten Dass" ("Bet It"). A 23-year-old contestant named Samuel Koch attempted to jump a car using spring-loaded stilts known as "kangaroo shoes." However, Koch hit the car and crashed, suffering major injuries. His initial condition was considered life threatening, although he emerged from a 10 day coma earlier this week. Doctors say that he will never walk again. An outpouring of sympathy and prayers for Koch has emerged from throughout the world. The top video was an interview with the host of the game show, Thomas Gottschalk, on German television that includes a few clips from the program where the accident occurred.